The City of Vaughan is brimming with creativity and local talents. 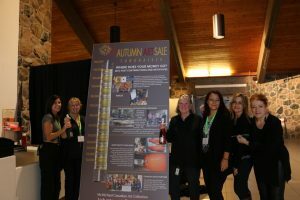 And in honour of this, the McMichael Volunteer Committee presented an Autumn Art Sale on October 19-21, 2018. This prestigious event invited some Canada’s most accomplished and talented painters and sculptors, applying for 50 coveted positions, and gave them the opportunity to do what the Autumn Art Sale does best—showcase their original works and unique designs. The setting of these pieces was in the McMichael Canadian Art gallery’s stunning Grand Hall. On display were artist pieces made with acrylic, oil, watercolour, mixed media, pen and Ink, sumi-e (also known as Japanese ink painting), wood, glass and paper. As a major fundraiser for the iconic McMichael Collection, this event allowed local art lovers to invest in a beautiful piece of original Canadian art. “A percentage of all art purchases during the Autumn Art Sale, goes to the Committee for volunteer-funded projects to enhance the visitor experience and support special gallery initiatives and valuable children’s education programs,” as mentioned on the event’s website. Congratulations to the 2018 Top Ten Artists who have been invited back to participate in the 2019 Autumn Art Sale. The Top Artists were: Ryan A. Sobkovich (“Best-in-Show”), John Shea, Jack (Jie) Zhou, Debra Tate-Sears, Kenneth Kirsch, Andrew Bonnycastle, Peter Rice (Sculptor), Doris Pontieri, , Andrew Sookrah, Anne Filiatrault, and Sue Miller.